Who should apply to Coro Fellowship of diverse individuals? WHAT MAKES A GREAT CORO FELLOW? 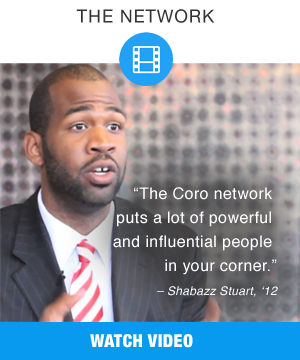 Coro Fellows have varying backgrounds, beliefs, and goals, but they are driven by a common desire to take action and expedite their impact in the world. They value lifelong learning and seek experiences that provide an opportunity to reflect and grow. Candidates may be at an inflection point, whether fresh out of school or in the workforce and looking for a path to their next opportunity. Fellows are eager to see where their passion can take them as they explore connections between sectors and apply their learnings in creative ways. Ideal candidates are curious and ambitious – open to being challenged and excited to collaborate with others across differences. They are self-defined change-makers and leaders in their communities, committed to taking on big issues and willing to adapt in order to make a difference.